Drifts of floating plastic that humans have dumped into the world’s oceans are flowing into the waters of the Arctic as a result of a powerful system of currents that deposits waste in the icy seas east of Greenland and north of Scandinavia. In 2013, as part of a seven-month circumnavigation of the Arctic Ocean, scientists aboard the research vessel Tara documented a profusion of tiny pieces of plastic in the Greenland and Barents seas, where the final limb of the Gulf Stream system delivers Atlantic waters northward. The researchers dub this region the “dead end for floating plastics” after their long surf of the world’s oceans. 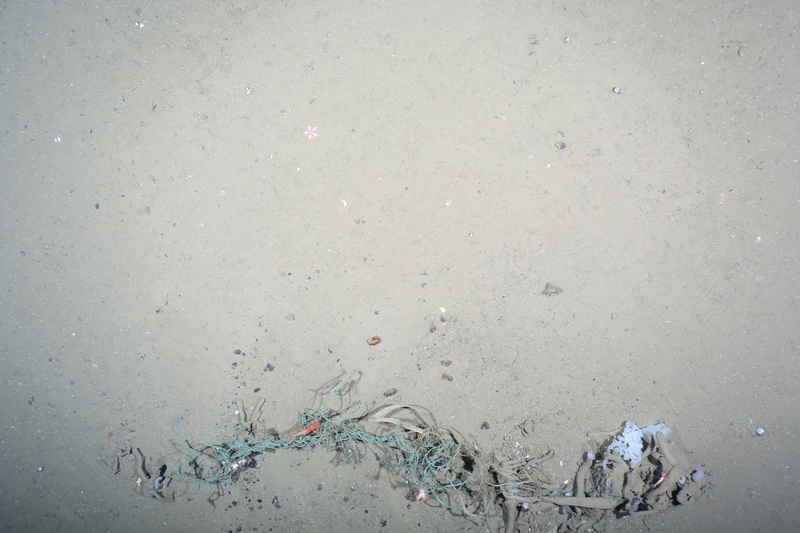 A piece of plastic net at the HAUSGARTEN, the deepsea observatory of the Alfred Wegener Institute in the Fram Strait. This image was taken by the OFOS camera system in a depth of 2500 m.
Finally, the study didn’t find much plastic in the rest of the Arctic ocean beyond the Greenland and Barents seas, also suggesting that currents were to blame. Instead the plastic had accumulated where the northward-flowing Atlantic waters plunge into the Arctic depths. Presumably, the plastic then lingers at the surface. The Greenland and Barents seas contained 95 percent of the Arctic’s plastic, the research found (the ship sampled 42 sites across the Arctic Ocean). The Barents Sea happens to be a major fishery for cod, haddock, herring and other species. A key question will be how the plastic is affecting these animals. The study’s results sent a troubling message to one researcher who has also focused on the consequences of plastic debris in the oceans and other waterways. The ocean circulation system in the Atlantic responsible for this plastic transport is part of a far larger “thermohaline” ocean system driven by the temperature and salt content of oceans. It is also often called an “overturning” circulation because cold, salty waters sink in the North Atlantic and travel back southward at deep ocean depths. As humans now put 8 million tons of plastic in the ocean annually, learning how such currents affect the plastic’s global distribution is a key scientific focus. Researchers, including Duarte, previously found that plastic slowly travels the world’s oceans but tends to linger in five “gyres,” or circular ocean currents in the subtropical oceans in both the northern and southern hemispheres. One of those gyres is located in the Atlantic, which then feeds the Arctic.